Pesto is simple, delicious sauce that tastes and looks fantastic on pasta, but it’s also quite versatile. As you are learning to cook, master the classic version before exploring interesting variations. You may soon stumble upon a new favorite. For an old-school Italian pesto, you only need a few ingredients: fresh basil leaves, pine nuts, garlic, extra-virgin olive oil and cheese. Some cooks season the sauce with salt and pepper. If pine nuts are too expensive or you just don’t care for the taste, The New York Times suggested walnuts as a substitute. While many recipes instruct you to combine and mince the nuts, basil and garlic in a food processor, Serious Eats recommended a low-tech approach. A mortar and pestle will result in a more pleasant texture, featuring tender pieces of basil in a range of sizes. This method improves the taste as well, since the flavors of all the ingredients come through in the mixture. Of course, it also requires more time and effort. 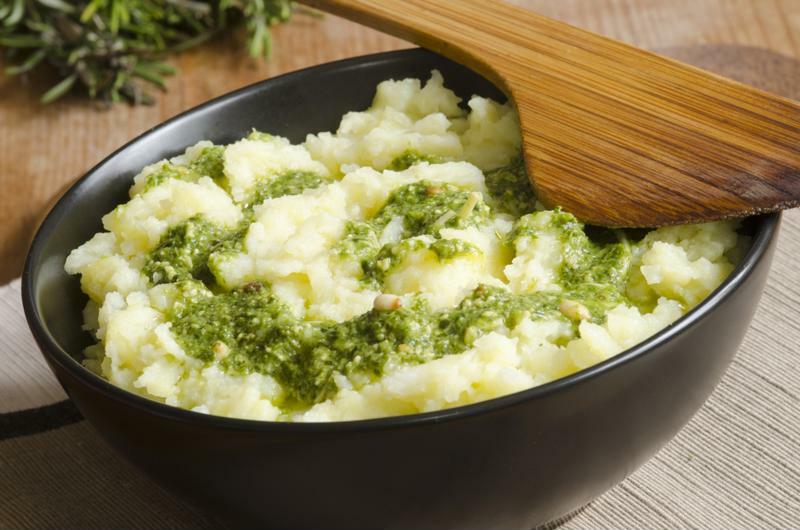 While you should grate a hard Italian cheese for your pesto, which one is a matter of personal taste and local availability. You can opt for pecorino, a sheep’s milk cheese, an Italian Parmigiano-Reggiano or a domestically made Parmesan cheese. On the other hand, you can combine two or more varieties. Just be sure the cheese is nicely ground or pulsed in with the other ingredients. Pesto is great on pizza or pasta, but you can find many other uses. However you combine the other ingredients, it’s important to add the oil in a slow drizzle, mixing as you go. This will allow you to control the consistency of the final product. The Kitchn recommended using a quarter cup if the pesto is going on a sandwich or pizza. If you plan on using it for pasta or soup, add about half a cup. Once your pesto is ready, the possibilities are endless. For instance, Martha Stewart’s Everyday Food provided a recipe for pesto pizza. You’ll spread the sauce onto the crust before adding tomatoes and mozzarella and cooking in an oven set to 450 degrees Fahrenheit. For something a little different, Bon Appetit recommended incorporating ramps, the wild onion with a garlic-like flavor, into your pesto for a spaghetti dish. Remove and blanch the greens from the ramps before cooking the spaghetti. After you make the pesto with the onions taking the place of basil, combine the sauce with the pasta and a half cup of the cooking liquid. Pesto is easy to prepare, but it has plenty of tasty applications. Try out a few as you take courses in an online culinary arts program.